Tableau 10 is here! And thanks to your ideas, it’s one of our best releases yet. There are dozens and dozens of new features in Tableau 10, and many started as requests you posted on our Ideas Forum. You told us you'd like to join multiple data sources in Tableau, as seen through Ellen Pfeiffer’s request for the “ability to JOIN data extracts” and Mark Jackson’s wish to “JOIN data from different sources." You’ve told us you'd like your teams to receive weekly emails about their progress. John Munoz requested the ability to “use administrator account to subscribe users to emails,” and Dawn McDonald made a similar request: “I want to create subscriptions for others." And you might recall we ran a survey on dynamic parameters, the most-requested feature on our Ideas Forum. When we asked you what you meant by “dynamic parameters,” many of you said what you’re looking for is a cross data-source filter. Now that's a feature in Tableau 10. These are just a few of the ideas that received close to 3,000 votes. Thanks to your ideas, we're always working to make Tableau a better product. Our developers are constantly monitoring your input for trends and use cases. Thank you for your continued input that inspires and motivates us to keep improving the products that we all know and love. 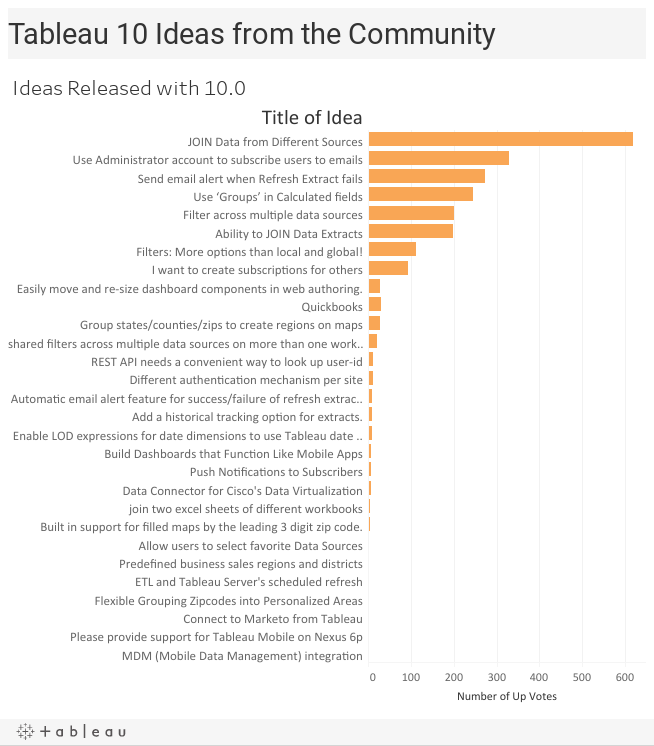 Enjoy Tableau 10, and do keep your ideas coming!